"To be a leader in this industry, you need to go along with your team. You are not just a manager that coordinates them, you also have to be friendly, show them that you are a part of the team, help them. In hospitality, if you don't work as part of the team, you are nothing." What attracted you to Hospitality in the first place? I grew up in restaurants and hotels. My uncle owns a small hotel, so seeing customers coming in and getting to know them, you could say that this was the first attraction for me. What do you think are the challenges facing the Hospitality industry? As you know we get different guests from different countries, each of them with a different culture. So the most challenges would be dealing with their complaints. If you are in the Food & Beverage, the complaints you usually receive are about the maintenance job or about the rooms. So the Customer Complaints can be challenging sometimes, however it's a nice side of the business. 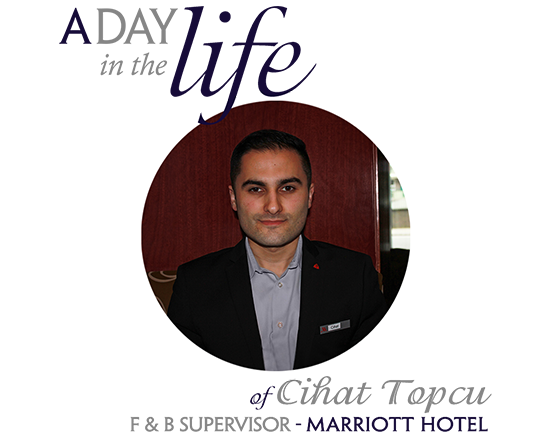 I started Hospitality Management back home in Turkey and I studied in the UK as well. I started as a waiter, but I also worked as a bartender many years. My previous job was at Grosvenor House JW Marriott Hotel. We were serving 2000 people, celebrities, BAFTA awards, magazine awards. At the end I wanted to move on, so I just came here. Same company, supervisor position. It's more challenging for me. When I arrive, I first check my emails, I check the bookings, I see the staff in the Restaurant and at the Bar, and we get prepared for the night. What is the thing you like most about your job? I would say the fact that you get to know different people every day. That's the thing. You don't repeat. You do have regular guests, which is good, but you always get new customers. In this job you're handling different complaints from different guests. Sometimes you might encounter a mistake, a misunderstanding, a miscommunication. So when I try to handle the complaint I listen to both sides and double-check with the guest, in order to avoid the mistake from happening again. How do you ensure your customers feel special? Once you get to know them you double check what they want, how to handle their requests. You always have to be prepared to go an extra mile for the guest. For example, I was a duty manager and a guest booked a suite with a washing machine. And the washing machine had an error, it kept turning and turning but it wasn't washing. They were a family with 2 kids and they specifically requested a washing machine with the room. So they wanted to wash. They informed me at 9pm about the failure, but there was no housekeeping at that time. We do have one washing machine down here where we wash staff's clothes, but we don't do it for the guests. We don't want to take the risk of damaging their clothes. But the guest was really insistent, so I told the lady that I could wash for her. I was supposed to finish at 11pm, but I took all the bags, I washed the clothes, I dried and folded them, and after that I prepared them for the morning delivery. I was here until 1am. This is what going an extra mile means. What do you consider the most important attributes a leader should have to be effective? To be a leader in this industry you need to go along with your team. You are not just a manager that coordinates them, but you also have to be friendly, show them that you are part of the team, help them. I want to set an example for my staff, this is why I act like a member of the team. Since you have been here, what changes or developments have you implemented to make a difference? I would say the drinks menu from the Bar. We came up with "Summer of Love" Milkshake. We went over the cocktails menu and improved it, we changed the layout. At the Restaurant we came up with Skills of Service, about the way we approach the guests and how we serve them. As a Marriott company we have a brand standard, but there were a few things missing. So I implemented those. We came up with new Lunch Menus, Breakfast Menus and also we added some specialties. The whole team brainstormed. What advice would you give to an individual who's starting a career in this industry? I would say that they have to be patient, they have to be willing to go an extra mile. This is not the type of office job, where you go and at 5pm you leave work. You have to be flexible, you have to like your job, otherwise hospitality is not for you. Sometimes I finish at 1 o'clock, and I have to be here again in the morning. But I don't complain. You also have to be hard working, and believe in teamwork. In hospitality, if you don't work as part of the team, you are nothing.